The Spanish region of Murcia continues to surge in popularity as a family holiday destination for UK travellers. Aside from the stunning beaches, the Costa Cálida – the warm coast – boasts a wealth of activities, culture and history to keep all ages amused. With warm, shallow seas, sandy beaches, and a wealth of activities to keep the children amused, it’s no wonder so many families are jetting to Murcia for their holiday plans. Boasting more than 50 glorious beaches and 300 days of sunshine every year, the Costa Cálida – the warm coast – clearly lives up to its name, especially as the sea temperature doesn’t drop below 22°C during the summer months of June to September. And with a seven-night break in June costing around £75 per night for a family of four, it represents fantastic value too. 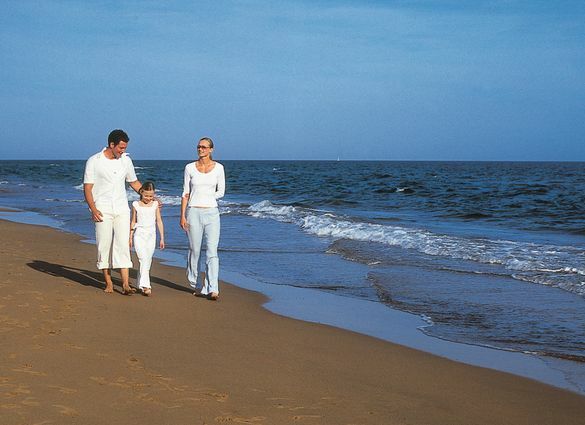 With seemingly endless stretches of coastline and the welcoming, warm seas of the Mediterranean and the Mar Menor to enjoy, the beaches provide the perfect focal point for any family holiday, which can only be enhanced with a bucket and spade. But there is so much more to Murcia to keep the young minds occupied and the entire family entertained with opportunities for budding amateur explorers, archaeologists, historians or scientists, which continues to see growing numbers of British visitors making the short trip. History is brought to life for guests with interactive and immersive experiences in Cartagena – a city with more than 3,000 years of history – or Lorca and its 100 coats of arms. If science and nature fire the imagination, the Science and Water Museum answers the curiosity behind the planets and stars thanks to its planetarium dome, which helps explain the mysteries of the dark skies. Archaeologists will be able to dig deep into the story beneath the hill of Monteagudo where the famous castle is located. Thanks to the discovery of an ancient archaeological site, it is now possible to learn about the lifestyle of the different civilisations which have settled in the area from the Copper Age to the Arab age. For those fascinated by what goes on under the sea, the ARQUA National Museum of Underwater Archeology in Cartagena offers a fascinating insight into the study and preservation of Spanish underwater cultural heritage. Among the many exhibits is an incredible collection of underwater treasure with more than 570,000 gold and silver coins from the late 18th century and the beginning of the 19th century. At Planeta Azul in Cabo de Palos in Murcia, the underwater discovery goes to new depths as visitors understand the region and its ocean floors with opportunities for diving, kayaking and various activities and educational opportunities on the mysteries of the sea. If an active adventure is more suited to energetic members of the family, El Valle makes for a wonderful excursion, just 6km from the city with recreation areas, picnic areas, children’s playgrounds and a host of sports activities. Alternatively, kick back and relax with a fantastic 45-minute tourist train ride through the streets of the historic downtown in Lorca which ends by the Fortress of the Sun, an ancient castle. A seven-night, bed-and-breakfast break in the three-star Pacoche Murcia, in Murcia city, for a family of four, costs just £532, based on four sharing a family room. Located in the centre of Murcia, several attractions are within short walking distance and there is also access to a swimming pool 150 metres from the hotel. Access to the Region of Murcia is simple as it is served by Murcia-San Javier airport all year round, while Alicante airport is also nearby. Both airports are served by numerous airlines flying from a wide variety of UK and Irish airports, with flights to Murcia-San Javier in June currently available at just £72 one way from London Stansted. Press release written and distributed, on behalf of the Instituto de Turismo de la Región de Murcia, by Azalea. The Costa Cálida, Region of Murcia is an ideal leisure and sport destination for UK travelers. The area offers year-round sunshine with an average temperature of 19.4°c and 315 days of sunshine per year. The picturesque region is just two hours from the UK by plane, in the south-east of Spain. The Region of Murcia is in a privileged setting within the Mediterranean basin and includes 252km of coastline, known as the ‘Costa Cálida’ or warm coast. Visitors can take their pick from numerous sandy beaches; a variety of water sports and diving locations; 22 top-quality golf courses, all within easy reach of each other; delicious culinary delights; relaxing spas; and the opportunity to explore the beautiful countryside and regional parks. The Mar Menor is a saltwater lagoon with warm shallow waters, gentle wind, sheltered coastline and many hotel facilities and sports infrastructures, which make it the ideal setting for water sports at any time of year, for all tastes and ages. Here, visitors can enjoy kite surfing, canoeing, sailing, windsurfing, water skiing and much more. They can also enjoy diving in the marine reserve of Islas Hormigas, settled in Cabo de Palos, which has been recognised as one of the best places for diving anywhere along the Mediterranean and where you can explore everything from historical wrecks to amazing underwater landscapes. The port of Mazarrón offers visitors a rich artistic heritage and a range of interesting leisure options, with more than 35km of beaches, unspoiled coves and rocky sea beds. Mazarrón Bay is sheltered by the foothills of the Sierra de la Almenara, while the port offers visitors many opportunities to learn about the town’s seafaring tradition. And just half-an-hour along the coast, another delightful port city, Águilas, blends a tradition of seafaring with a wide range of tourist facilities, making the most of one of its main attractions, the extensive coastline. There is much to remind visitors of its 19th-century heyday, when it was a major mining enclave, such as the Hornillo jetty, where iron, lead and silver were loaded on to ships. There is always something going on in the region with a host of big events and festivals taking place throughout the year, including the international music festival WAM Estrella de Levante in Murcia at the beginning of May, or the varied summer festivals including ‘La Mar de Músicas’ in Cartagena, or the International Jazz Festival in San Javier, both in July. And visitors can also enjoy August’s ‘El Cante de Las Minas Flamenco Festival’ in La Unión. The Region of Murcia is the perfect holiday destination – for sea, spa, or sport, countryside, culture or cuisine – at any time of the year, whatever your passion.